Crawl space insulation can make your whole house more comfortable, improve the air quality, and reduce your energy costs. It's especially important to seal and insulate your crawl space if there's heating and cooling equipment, ducts, or plumbing in there. If your crawl space is vented, uninsulated, doesn't have enough insulation, or has old fiberglass batts, Woodford Bros., Inc. can solve your crawl space insulation needs. Contact us today to schedule an on-site crawl space insulation estimate in Syracuse, Binghamton, Utica, Rochester or the surrounding area in New York. If you have an uncomfortable home, cold floors, or moisture problems in your crawl space, contact Central New York's crawl space repair experts at Woodford Bros., Inc. for a complete solution. Our innovative crawl space insulation solutions will ensure that you have a more comfortable, energy efficient home. 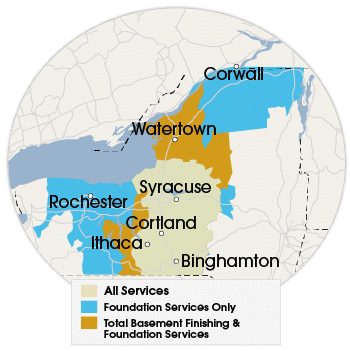 We offer no-obligation crawl space consultations and free cost estimates to homeowners in Rochester, Binghamton, Syracuse, Utica and surrounding areas in New York. Contact us today to request yours!